Written texts can be very powerful, but add sound and those words gain an extra dimension; just think of the difference between reading a speech and hearing one, particularly one delivered by a talented orator. In addition to speeches, primary source audio recordings include interviews, press conferences, testimonies, advertisements, entertainment broadcasts, and more. The analysis of audio recordings, like primary source images, Common Core English Language Arts Standards (CCSS), including grade 6-12 Literacy in History/Social Studies Reading Standards and Speaking and Listening Standards 2 and 3. 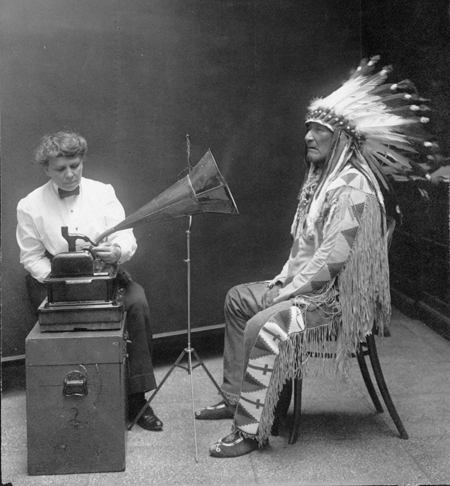 The Library of Congress American Memory collections provide a good variety of primary source audio recordings. To help students analyze audio recordings, you can have them use the Library’s primary source analysis tool and the list of guiding questions provided below. What type of recording is this (speech, interview, press conference, testimony, advertisement, entertainment broadcast, etc.)? What is the title of this recording? Who helped to make (perform, produce, or broadcast) this recording? Is the recording easy or difficult to understand? Describe any background sounds or special effects you hear in addition to voices. Are there details that suggest the time period this recording relates to? Is the creation date listed in the bibliographic record? If the creation date is listed, was this recording created at or around the same time period the content relates to? What other details can you hear? What tone does the recording? Why do you think this tone was used? How does the tone affect the feeling or mood of the recording? If background noises or special effects are present, how do they affect the feeling or mood of the recording? Why do you think this recording was created? What might have been the purpose of making this recording? What evidence supports your theory? Who do you think was the audience for this recording? What do you think the creator might have wanted the audience to think or feel? How do you feel during and after listening to this recording? Does the recording show bias through words or tone? If so, towards what or whom? What evidence supports your conclusion? If there is a transcript, how accurate does it seem? Explain the reasoning for your answer. What was happening during the time period this recording represents? If someone created this recording today, what would be different/the same? What did you learn from listening to this recording? Does any new information you learned contradict or support your prior knowledge about the topic of this recording? QUESTION: What didn’t you learn that you would like to know about? What questions does this audio recording raise? What do you wonder about . . . Please feel free to download and distribute the Audio Recording Analysis Guiding Questions document and the primary source analysis tool (but please keep the formats, including logos, intact).